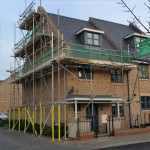 We have, since 2013 employed Spitfire Scaffold for all our scaffolding requirements. From the northern home counties to the extremities of Norfolk and Suffolk we have found their overall ability to perform and meet very specific requirements a perfect match. Any issues on site are swiftly handled, and Nigel from Spitfire is always contactable in any event. In addition, we have always found Spitfire Scaffold to be very price competitive. We highly recommend their services. Thank you for a job well done by your team, I will use you again!